In the first online public meeting offered by the Idaho Transportation Department, Treasure Valley residents will be able to conveniently learn about improvements to Eagle Road and ask questions using ITD's new online public meeting format next week. Information exchanges through the Internet will enable citizens to receive and provide information about the project in a format that fits their schedules. It calls to mind Norman Rockwell and the old idyllic Saturday Evening Post covers that depicted the best of American family life. Drivers near the new Ten Mile Interchange between Meridian and Nampa will notice a new mural on the interchange wall. It’s a cast concrete relief overlay showing a man, woman and child walking down a pathway, holding hands. The family-themed mural portrays the trio on a winding path near a blooming tree, with a mountain scene as the backdrop. ITD is partnering with universities and local school districts this summer to provide young people an opportunity to learn more about the department’s wide range of transportation-related activities and career paths. Summer outreach activities begin with as many as 100 students from Canyon County’s middle schools participating in separate field trips to ITD June 8 and June 15. Students will tour Headquarters and District 3 facilities where they will watch demonstrations, meet and learn from department personnel and try some hands-on projects. The good news is Idaho drivers remain among the most knowledgeable in the country when it comes to understanding the rules of the road. The bad news is Idaho fell from best in the nation on the annual GMAC Insurance knowledge test in 2009 to eighth last year and 11th this year. GMAC has provided an online knowledge test the past seven years, and Idaho drivers typically score among the best in the U.S.
Floods and the potential for record runoff in many areas of the state prompted Gov. C.L. "Butch" Otter to declare a " Statewide Declaration of Emergency," last week. The declaration, approved Friday (May 27), brings the availability of state resources and rapid response to support impacted areas. Currently Bingham and Jefferson counties are listed under the State Declaration. Although a 2009 Governor’s Executive Order required ITD to implement zero-base budgeting (ZBB) in two stages the department’s management decided to include all programs in its FY13 zero-base budget analysis. The change to ZBB is being done in conjunction with the department’s re-alignment to ensure that programs match legal mandates by reviewing all programs, including funding and personnel. The report is due to the Division of Financial Management on Sept. 1. After 22 months of construction, the new Ten Mile Interchange opened to drivers headed home on their evening commute Wednesday. Although the interchange is open, construction will continue below the bridge on the median section with some lane restrictions until that work is complete. Warmer months are best for the paving that will take place on the median section. 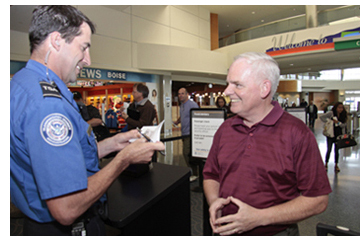 ITD Director Brian Ness had no problems when presenting his identification for airline travel recently, although it wasn't the conventional laminated card found in most wallets or purses. He handed over a temporary document printed at a county driver's license office. The printed "license" was issued in Ada County as part of Idaho's conversion to a centrally issued license system. The new process was introduced in Payette County; Ada County followed this week. The central-issue system will expand to all licensing offices in Idaho before the end of June. Last week ITD contracted with 3M to lead a major Division of Motor Vehicles modernization project that is expected to take 42 months to complete. Design and development sessions already are planned, and work was expected to begin this week. 3M brings myriad success in technology modernization to the ITD project, including similar work in other states. It offers a proven solution that can be tailored to meet Idaho’s needs. ITD and District 5 lost a long-time colleague and friend Saturday morning (May 21) when Tim Swenson passed away in Pocatello at the age of 65 after a courageous battle with cancer. His passing brings to close a four-decade career of dedicated service to the department and citizens of Idaho.